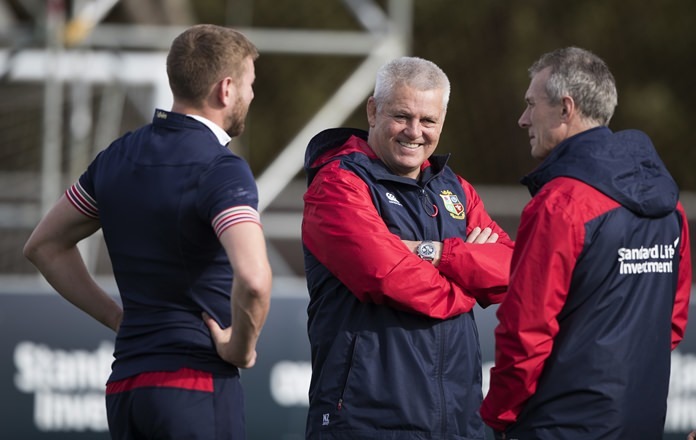 Wellington, New Zealand (AP) — British and Irish Lions coach Warren Gatland has called on his midweek lineup to continue the momentum gained with last weekend’s win over the New Zealand Maori in Tuesday’s tour match against the Chiefs at Hamilton. Gatland believes the 32-10 win over a strong Maori side has given the Lions new impetus ahead of Saturday’s first test against New Zealand. While Tuesday’s team contains few, if any, of the players who will face the All Blacks at Eden Park, Gatland says the midweekers will play a role in keeping the Lions’ confidence high approaching the three-test series. Saturday’s win in Rotorua was by far the Lions’ best performance in five tour matches to date, improving their record to three wins and two losses and providing the best showcase yet for the style of play they will adopt throughout the test series. A strong set piece, contestible kicking, and a good kick-chase backed up by solid work at the breakdown and sound defense set the platform for the win over the Maori. Gatland will hope to see that continue against the Chiefs. Tuesday’s match against the Chiefs will have little impact on the Lions’ test preparation, unless they suffer a third midweek defeat which will affect the mood in the touring camp. Gatland has clearly divided his squad into test and midweek lineups and it was for that reason he called on six players — four from Wales and two from Scotland who are currently playing in the South Pacific — to bring up his current complement to a full 46 players, the equivalent of two match-day 23s. He has called on Gareth Davies, Cory Hill, Tomas Francis and Kristian Dacey from Wales and Scotland’s Finn Russell and Allan Dell, all of whom have been named on the bench against the Chiefs. The larger squad should keep to a minimum the number of players having to play twice in a week. But Gatland has been heavily criticized by some British coaches and former players. England coach Eddie Jones said Gatland has resorted to selecting players on the basis of “geographical proximity” rather than ability. “I can understand why Warren Gatland has done what he has,” McGeechan said. “I have got no issues with protecting the test team by calling up some extra cover for midweek. New Zealand commentators have condemned the Lions as boring and have criticized the one-dimensional nature of their game plan. The tactic of using scrumhalf Conor Murray to repeatedly kick into the box worked against the Maori on a dewy night in Rotorua but is thought less likely to succeed against the All Blacks. While the Lions had 75 percent of possession in the Maori match, including 90 percent in the second half, they scored only one try from general play. Otherwise, they relied for their win on a penalty try and six penalties from fullback Leigh Halfpenny. Having seen the All Blacks score 12 tries in a 78-0 win over Samoa on Friday, including a number of counter-attacking tries from kicks, the Lions must realize that kicking to the All Blacks will be a hazardous practice. Gatland instead complained about illegal blocking tactics by New Zealand teams. He said he had already raised the issue with the officials for Saturday’s test, an indication the Lions will try to exert as much pressure as possible on the referees. “The frustrating thing for us is the amount of blocking that is going on,” Gatland said. “It makes it difficult to complete attacking opportunities. For that to become an issue, the Lions would have to show more attacking intent than they did against the Maori. They might do so against the Chiefs. Gatland will want to a leave a good impression in a town in which, as a player for Waikato province between 1986 and 1994 and coach between 2005 and 2007, he has always been much-admired.